For the last few years since we have moved our Thanksgiving Festivities to our house from my parent’s we have had a definite beer twist to our meals. Actually I have been refereeing to them as Thanksgiving Bier Dinners. Usually “Bier” since they are mostly Belgians. The beer menu usually consists of a beer for each course and a final digestive/final snifter. This is usually 4 different beers plus and extra one or two to account for personal tastes. Before I get into this years menu I need say a few words about pairing and what I have done in the past. Pairings can be complementary keeping to similar flavors and style or Contrasting which would give you an opposite comparison. A complementary pairing would be; a pale ale with a poultry. Contrasting pairings usually come into play more with spicy foods, when you would offer a more malty beer to smooth or cut the spice. The challenge of a Contrasting Pairing is that you don’t want the beer to overpower the meal. In previous years for the main Turkey Entrée I have paired beers such as Pauwel Kwak, a Belgian Strong Pale Ale, and La Botteresse Brune, Exquisite Artisan Ale brewed with spices and herbs such as sage. I must say that La Botteresse Brune is hands down my number one overall choice for Thanksgiving. This bier really is Thanksgiving Dinner in a Glass. If you have never had this bier you really need to treat yourself to it. Now that being said I took a completely different route this year. 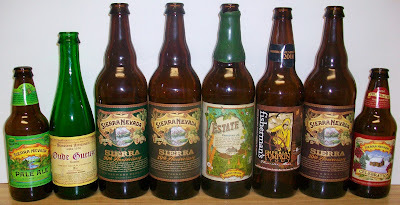 I attended a Sierra Nevada tasting at State Line Liquors last week. 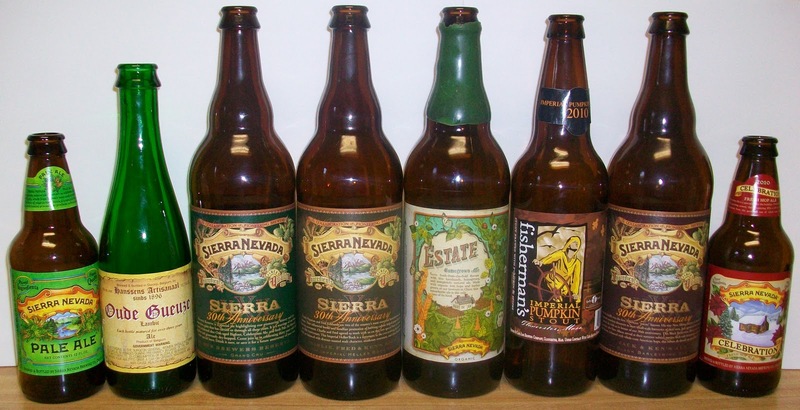 I was so impressed with the Sierra Nevada offerings this year that I decided to pair 8 of them with our Thanksgiving meal. Yes there are more beers than courses but I have the luxury of pairing a complementary and contrasting beer plus a few labels just to fill in during the evening. So here is my Thanksgiving Beer Dinner for 2010. An excellent American Pale Ale that will go good with any lighter foods and appetizers. This may be a little strong for appetizers but it will be a perfect Aperitif to open up the palate. This is a very unique beer; An American Strong Ale with subtle complexities that will get lost if served later in the meal. The unique fresh hop complexity and sharpness of this beer should be an interesting contrast to the rich but milder traditional flavors of the Thanksgiving Meal. The smooth malt flavors of this lighter Maibock/Helles Bock should excellently complement the roasted turkey, gravies and accompaniments of the Thanksgiving Meal. The rich malt and smoky flavors of this Imperial Stout will enhance any sweet dessert. This delicious stout is also suitable as dessert all by itself. This Black Barleywine is a unique twist on an American Barelywine. This should be an excellent final snifter. This is probably the best simple complementary American Pale Ale to pair with a poultry dinner. It will make a very good less intense substitute for the Entrée Pairing. This “Fresh Hop” IPA could also be a good substitute contrasting pairing for those who are having more then one with dinner. Well, I’m not sure where to start. I guess a picture of the spent bottles will give you some inclination of how the dinner went. First of all Kathy provided an amazing meal. Everything was cooked to perfection and tasted great; from the turkey to all the accompanying dishes to the pies for dessert. And all I had to do is chill some beer and stay out of her way. The only disappointment was the fact that I could not find the stout; 30th Anniversary - Fritz And Ken's Ale. So I substituted the Cape Ann Fisherman’s Imperial Pumpkin Stout. The good news is that I have a bottle of each left over so I can either review them or save them for Christmas. I guess I should also mention that we had a few home made beverages also. Molly and I made a Blackberry Mead about a week before that really turned out pretty good. It was a little young yet so I still have a few quarts fermenting. I also made some Eggnog that Pop Pop Burns would be proud of. This Nog has more Brandy and Rum than cream and eggs. The day started off with fresh baked cinnamon buns and coffee, yes, Kathy again. Of course I had a little something in the coffee. Late afternoon I had a few warm-ups of the Sierra Nevada Pale Ale and Celebration Ale waiting for the appetizers to come out. As I figured this was a little robust for the appetizers but it was a great aperitif. Some were taken back by starting off with such a big beer but the complexities of this beer would have gotten lost if I served it later in the meal. 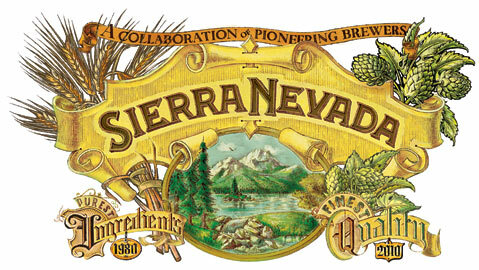 It was nice; rich and complex with that Sierra Nevada bite. This is a blend of their Oaked Aged Bigfoot, Celebration Ale and their Pale Ale. It was an excellent beer to start the evening off. Boy, I almost forgot that I added a Gueuze to the menu at the last minute. I had to get a Belgian in there somehow. I may have been the only one that appreciated the unique sour flavors of this Old Gueuze. Just one small sip and it cleansed the palate for the next course. If you like Gueuze this one is outstanding. I found this to be an excellent complementary pairing. This bock is great. It was nice and smooth with a clean finish. It almost has a little bite to it. The malt characteristics of this beer really blended nicely with the roasted turkey and gravy. It really complemented the meal well. With my second helping I went with the Estate Homegrown Wet Hop Ale, Estate Harvest (Contrasting Pairing) American IPA | 6.70% ABV. This was also an interesting pairing. It may have been too hoppy for some but the hops never overpowered the meal. Then again if you were a hop head this would be a perfect pairing. There was in interesting hop complexity to this beer that was still present during the meal. I think my son John and I were the only ones to have both beers with our meal. This is where I had a substitute; the Fisherman's Imperial Pumpkin Stout by Cape Ann Brewing Company, Pumpkin Ale | 11.00% ABV. It turned out to be a great dessert beer especially with Kathy’s Pumpkin Pie. Wow, it was really good. This is smooth and rich with just a nice hint of natural pumpkin on the finish. And at 11% it’s and interesting warmer too. I must say by the time I got to this beer I was beat. I really don’t think it was the alcohol, no really. We can blame it on the tryptophan, yeah that’s it, it was the tryptophan. At any rate I do remember commenting on how dark and malty this was for a Barleywine. It was very smooth and not too overpowering. This almost seemed light for Barleywine, well at least I don’t remember it being boozy. But this is one that I need to have again. So that’s how Thanksgiving went down this year. All and all it was an excellent beer pairing to an excellent meal. I’m still not sure what to do with the beer leftovers; I will most likely be reviewing them soon. I hope everyone had a Blessed and Happy Thanksgiving! Just purchased the Helles Bock. I can't wait!! Hey Ken, The Bock was good. I thought it was a good complement to the meal. I'll be updating this post with post reflections. Pick up the stout if you can. I can't seem to find it around here anymore.